3 Bedroom, 2 Bath With Large Loft. Prime Location 5 Min Walk To Lake & Town. Located in the very popular, East are in the center of everything while staying at our cozy cabin! A prime location, walking distance from stores, restaurants and the lake. Shaver Lake is the perfect place to vacation. The climate is ideal with cool summers and mild winters. The list of activities is long and include, hiking, fishing, skiing, sledding, boating, snowmobiling, horse back riding and more! China Peak ski resort is just a 30 min drive from the cabin. 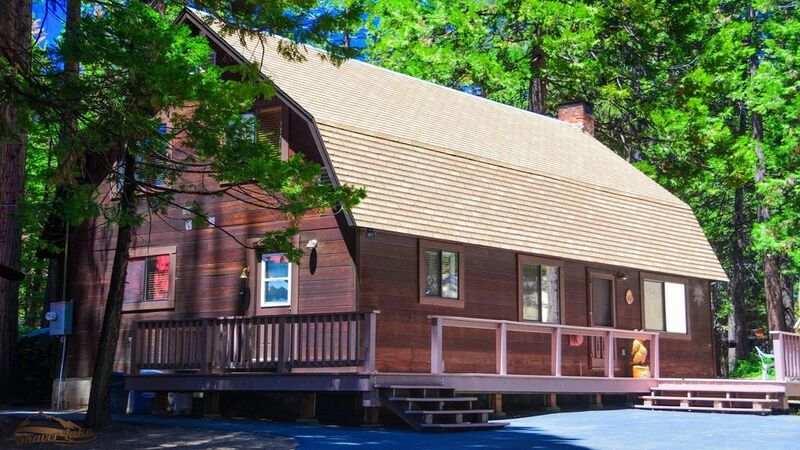 This cozy, clean mountain cabin is tucked away in the highly sought after East Village of Shaver Lake. Enjoy a complimentary bottle of wine upon your arrival! Beautiful NEW hardwood flooring throughout! Enjoy a complimentary bottle of wine upon your arrival! We've outfitted our cabin to suit the needs of a modern vacationer. Beautiful NEW hardwood flooring throughout! A fully equipped kitchen provides a user-friendly space to cook a meal. A washer and dryer in the cabin are perfect for soggy ski clothes. Entertainment options like flat-screen TVs mean you can cozy up with a good movie next to the fireplace! Large deck with table and chairs in the summertime, with a good cup of joe in hand (complimentary selection of coffee and hot cocoa are offered, of course). We have a crockpot, waffle maker, and flat griddle great for pancakes or crepes! We have a nice covered bbq area with a charcoal bbq. You will need to bring charcoal. 2 flat screen tv's, vhs/dvd library, and board games. We do not have wifi. We find we spend more time enjoying the outdoors with out it! There is a cafe right around the corner (5 min walk) that offers free wifi. Two bedrooms, each with queen beds and dressers. The loft has two double beds and a full pull out couch. New mattress and linens. Towels - We DO provide clean bath towels, hand towels and wash cloths. Toiletries - We DO provide shampoo, conditioner and soap for each bathroom. It's our happy place & we are excited to share it with you! The cabin is for families and friend getaways only, no parties. We are the owners, not a rental agency. We have neighbors who live next to our cabin year round and we want to respect that. No pets. Family of four who enjoy the outdoors and spending time at our cabin with family and friends. We chose Shaver Lake because we grew up visiting as children and have fond memories. We enjoy Shaver Lake for all it has to offer. Lake time in the summer and skiing/snowboarding in the winter. Highlight of our cozy cabin is the location. Off the main roads, so it is quiet, but close enough to walk to town and the lake. The cabin does not have central heat or air. The primary heat source is the wood burning stove. We supply the firewood and have the fire set ready for you to light when you arrive. We have both a Kruig, regular coffee pot & coffee grinder. Enjoy a cup on the deck! We have all the things you need to create the perfect meal! Crockpot, waffle maker, and flat griddle great for pancakes or crepes! Great Time in Shaver Lake! We had a wonderful time in the snow. Amazing Skiing at China Peak with a cozy cabin to enjoy in the evening. Fireplace. Well stocked kitchen. Wonderful Parking. Two bedrooms with doors that close. Third bedroom is a loft with 2 beds and electric fireplace, foosball and board games. Perfect! Wonderful experience and snow trip for all! This was an amazing cabin and the owners were so helpful as we planned our trip. The cabin is very clean and worked well for our two families. We will definitely be returning at another time! This was our second stay... so much fun! Thank you! Had an amazing time in this nice cabin near Shaver Lake over Thanksgiving. We were two families with 4 kids, it was perfect for the eight of us. Nestled between tall trees the place is quite and peaceful. Very close to Camp Edison on Shaver Lake which is a great place to spend the day. Thank you Jamie for making our stay comfortable. Great cabin for four. Everyone had their own bed!🙂👍 did not have sleep on the floor with pad. Thanks Tim! We appreciate you taking the time to review. Glad you had a nice stay! !